Thirty thousand men, women and children from Sudan’s Blue Nile State sought an end to nine months of terror and trauma when they crossed the border into neighboring South Sudan in June 2012. They joined a population of 70,000 refugees who preceded them in fleeing Khartoum’s deadly military campaign to crush SPLM-N, the northern remnant of the Southern liberation movement. These are the shoes that made the journey. Fleeing in fear was a new experience for nearly all of these June arrivals, a largely Muslim population from Bau county, which was northern territory during the prolonged Sudanese civil war. Many had never left the vicinity of their villages before shelling, bombardment and gun-toting soldiers drove them away starting last September. They travelled from the bush to the mountains and back again for months, rarely spending more than a week or even a few nights in one place. Advances made by the rebel soldiers in May opened a corridor to the border with South Sudan, but it was still a trek made perilous by the dearth of water and food as well as the risk of ambush and attack. Those who crossed the border officially became refugees, a status they share with more than 30 million people around the world who have had to leave their homes, no longer safe in their own country. 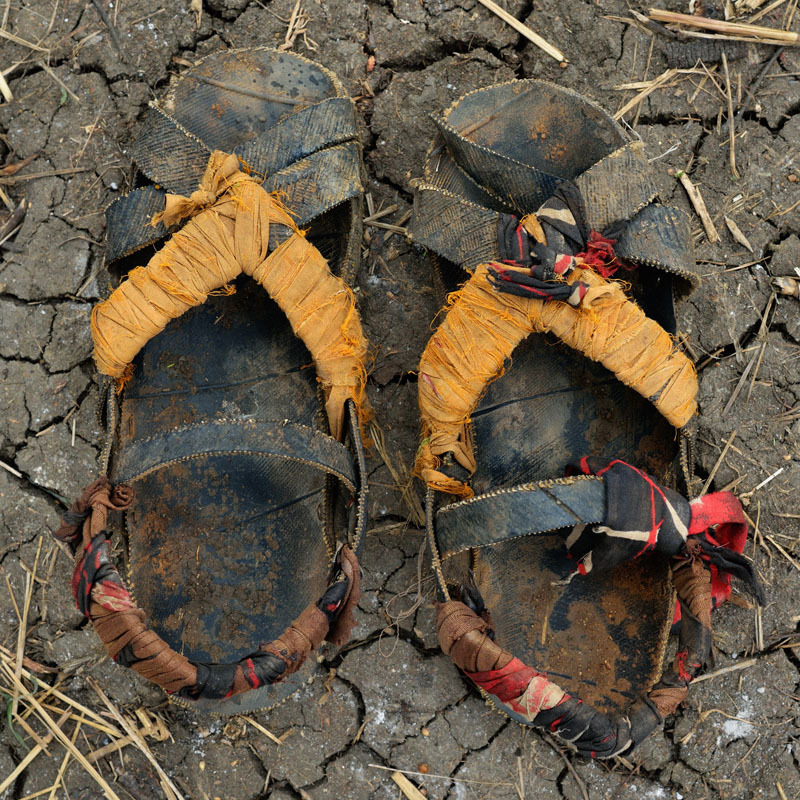 The wide-ranging array of worn-down, ill-fitting, and jerry-rigged shoes form a silent testimony to the arduous nature of the journey, the persistence and ingenuity of their owners, and the diversity of these individuals thrown together by tragic circumstance. Saddam Omar, a 25 year old man from Pi, walked at least 8 days to reach the border after months of displacement in Blue Nile State.